Dr. Stibich is a founder of Xenex and, as its Chief Scientific Officer, he oversees scientific research, product development, facility assessments, and protocol design. He leads new technology development and is an inventor on multiple patents. Dr. Stibich meets frequently with infection prevention representatives at healthcare facilities, helping them understand and solve their infection control challenges while analyzing hospital results. Dr. Stibich holds a doctoral degree from the Johns Hopkins University School of Public Health, a Masters in Health Science, also from Johns Hopkins, and a bachelor’s degree from Yale University. He has conducted research in Russia, Tajikistan, Afghanistan, South Africa, Kenya, the United States and Brazil. As an epidemiologist, Sarah Simmons works with customers to implement Xenex’s pulsed xenon UV light room disinfection technology in their facility, provide support for customers’ Infection Prevention departments, and evaluate their infection reduction results for publication in scientific journals. Sarah worked as an Infection Preventionist for five years in San Antonio, with a focus on infection prevention in critical care. She is a member of the San Antonio APIC chapter and has served on the board in numerous roles. Sarah is a Doctoral Candidate at the University of Texas School of Public Health, has a Masters of Public Health in Epidemiology and Biostatistics from the Texas A&M School of Rural Public Health, and a Bachelors degree in Biology from Texas A&M University. This entry was posted in C. diff. 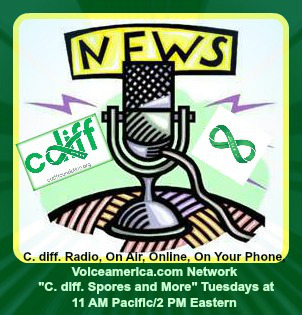 Spores and More Global Broadcasting Network and tagged C. diff. spores and more, C. difficile environmental safety, CIC, Clostridium difficile disinfecting, Dr. Mark Stibich, HAI's, Healthcare, MPH, PhD, Sarah Simmons, UV disinfecting, UV-C disinfection, Xenex, Xenon on April 20, 2015 by cdifffoundation.